Landscape architect Arthur A. Shurcliff (Lot 6247 Orion Path) designed the Governor Bradford (1949) and Governor Winthrop (1944) lots during the 1940s. Shurcliff, best known for his work as chief landscape architect at the recreation of Colonial Williamsburg, was one of the major practitioners of the Colonial Revival style. During World War II, designs focused on paying tribute to America’s past, particularly honoring the Colonial era. At Mount Auburn Shurcliff created two Colonial Revival gardens with the two Governor lots in the south-western side of the Cemetery. 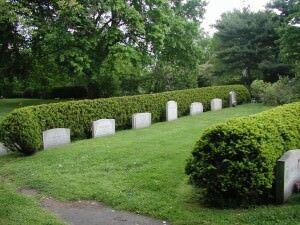 Shurcliff surely drew on images of the Colonial burial grounds in designing the lots for Mount Auburn, but created more ordered spaces, characteristic of the twentieth century Colonial Revival, rather than a faithful replication of a Colonial-era burying ground. The Cemetery permitted only single slab or flush monuments in an effort to create the atmosphere of a traditional burying ground. Lots were also named after notable Colonial figures in reference to the era. In addition to the “Governor Lots,” Jefferson Lawn (1944) was laid out in a similar fashion in the same area along Bluebell Path. These three corporation lots helped to meet the growing demand for single graves as people had less need for large family lots.